Background: Plant natural products (PNPs) play a key role in human health and life quality through the treatment of diseases and as supplements in the food and healthcare industry. These high-value metabolites are traditionally extracted from the natural resource, but ongoing research is exploring the possibilities to construct efficient microbial cell factories that can replace current production methods. Objective: This review describes recent progress for producing PNPs in S. cerevisiae. Conclusion: Various PNPs, including stillbenoids, flavonoids, terpenoids and glucosinolates can now be produced in the baker’s yeast Saccharomyces cerevisiae. As a result of the growing interest in the expression of plant biosynthetic pathways in yeast, many studies have aimed at developing platform strains delivering an improved supply of precursor metabolites. Synthetic biology tools facilitate the identification of superior enzymes, balance gene expression levels in the pathway, and enable the spatial arrangement of plant-derived enzymes in yeast to optimize the performance of the introduced pathways even further. Perspectives: The entry of CRISPR/Cas9 based technologies may allow other yeast species or filamentous fungi to be engineered for the production of PNPs. 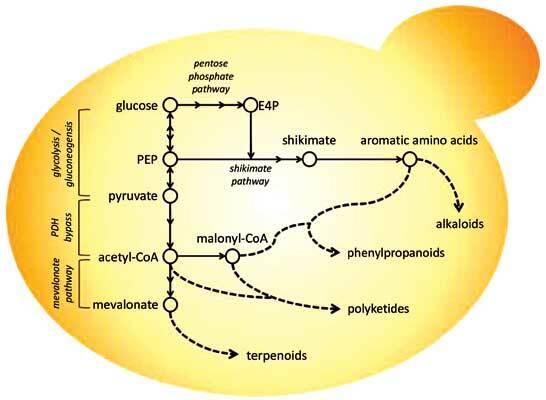 Plant secondary metabolite, enzyme discovery, metabolic engineering, yeast chassis strain, PNPs, biosynthesis pathway.